Willie Green goes airborne for a dunk against the Knicks. Green made all four of his shots in Wednesday's victory. The 76ers take a quick two-game trip to Charlotte tonight and Milwaukee tomorrow night. They return home to start a six-game homestand beginning Monday against Kenny Thomas, John Salmons and the Sacramento Kings and continuing Wednesday with two-time MVP Steve Nash and the Phoenix Suns. Kyle Korver. Or maybe more accurately, Kyle Korver's feet. 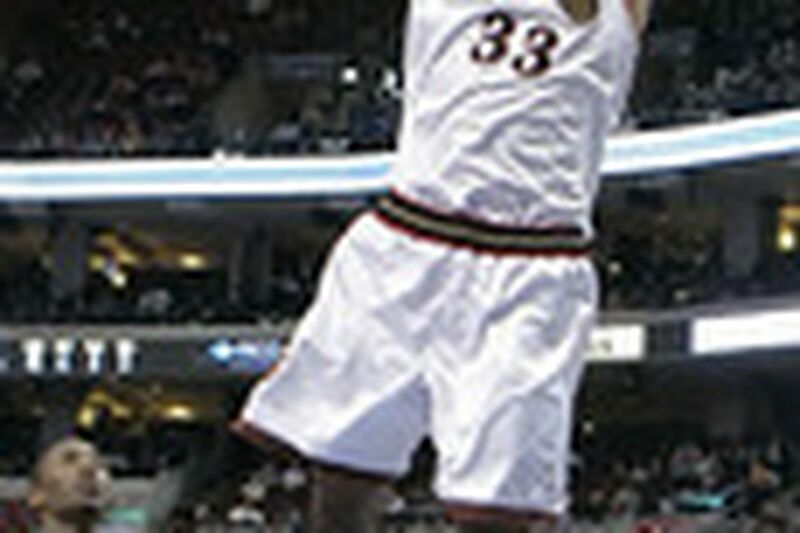 Freshened and virtually pain-free thanks to a week off, Korver tied career highs for points (31) and three-point baskets (six) in Wednesday's win over the Knicks. He went 11 of 14 from the field and 6 of 7 from beyond the arc. Korver is struggling with turf toe on his left foot and plantar fasciitis in his right. Coming back from a sprained right ankle and hampered by an inflamed bursa sac on his left elbow and a bruised hip, Allen Iverson scored a season-low nine points for Denver against San Antonio, then said he would focus on practice (practice?) to snap out of his slump. "There was just rust on me," Iverson, who had missed eight of the Nuggets' nine games before Tuesday night, said in the Denver Post. "That's just one of those games that makes me want to come and get in the gym and work that much harder to get some type of rhythm." Last season, the Sixers were outscored off the bench in 61 games and went 26-35. They went 11-7 in the 18 games their bench held the scoring advantage. In their only game last week, the Sixers' reserves scored a season-high 58 points in easily outdistancing the Knicks' reserves. For the season, they are 12-16 when they outscore the opponent's bench, 6-19 when their bench is outscored, and 0-1 when their bench equals the other team's. In the even-numbered quarters of Wednesday night's game, the Sixers shot 80.0 percent and 62.5 percent from the field and scored 65 points. Since no Sixer was in the All-Star Game, we'll turn it over to Lower Merion High's Kobe Bryant, who spoke after receiving his MVP award of how he trash-talked last weekend with Julius Erving and Michael Jordan, two of his fellow judges in the Slam Dunk contest. "You get guys in the same room who are extremely competitive," Bryant said, "and you start comparing records and sneaker technology and what a guy would have done if they had the technology we have, comparing hand size and who can palm the basketball and who can do what." Added Bryant, "It's something I'll remember forever."